Floyd Mayweather Jr. is coming the rescue of his ex-enemy Adrien Broner … taking the boxing star into his home after Adrien’s Internet suicide scare … TMZ Sports has learned. Floyd’s reps tell us Mayweather saw the post, and reached out to Adrien, inviting him to crash in his Vegas mansion until AB is feeling better. “Floyd is taking care of Adrien” … says the rep.
Looks like the healing has already begun … the two men hit up the Lakers game in Sin City Thursday night … and were tooling all over the strip in Floyd’s million dollar Bugatti. Adrien has deleted the super scary message from his social media … and looks like he’s having a good time … which is great to see. Adrien Broner’s close friends are worried he may kill himself — and have contacted police to check in on the boxer after he went to social media and strongly implied he was going to take his own life. 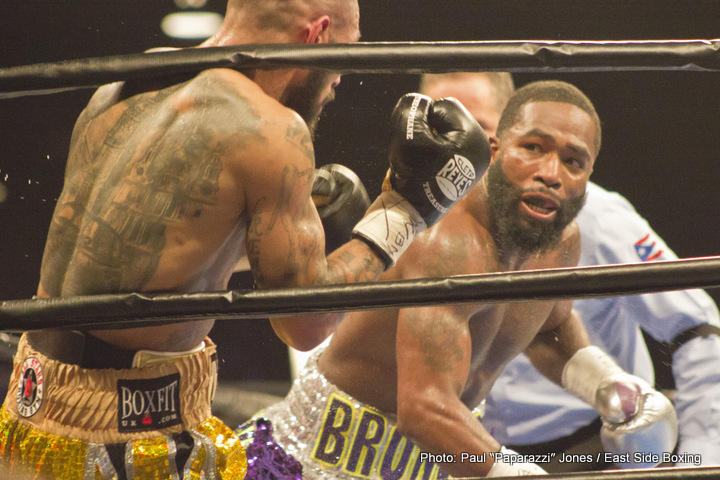 We tried to reaching out to Broner to no avail — but several of his friends told us they’re extremely concerned and at least one friend says he’s contacted police to help. Previous boxing news: Hopefully the big, big fights will come for Danny Garcia in 2017: Thurman, Canelo?